Black Locust, also known as Pseudo Acacia and as Robinia, is a great alternative to the endangered hardwoods from tropical countries. In fact, the Rainforest Alliance promotes the use of Black Locust, readily available here in the US, for outdoor projects and boats. Is it true that Abe Lincoln chopped Black Locust to make fence posts? So goes the legend. 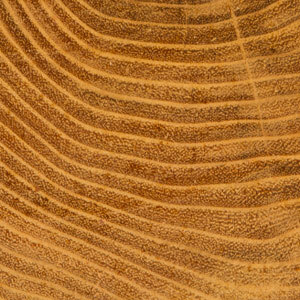 Black Locust is a tough wood with a willingness to be steam-bent. Its color, different from many of the other woods we carry, ranges from greenish-yellow to dark brown. Its grain is open, dense, and beautiful. It is stable once it's cured. Somewhat similar in appearance to Black Locust, Honey Locust is technically in a different genus, (Robinia and Gleditsia, respectively), and telling the two apart is somewhat similar to separating White and Red Oak - the pores of Black Locust are packed with tyloses, while they are absent in the pores of Honey Locust. Honey Locust heartwood is a medium to light reddish brown. Wide sapwood is a light yellow, clearly distinguished from the heartwood. Both Black and Honey Locust can be challenging to work with because they are extremely hard, but they are prized because the heartwood is rot resistant and long-lasting. We find that if you take your time in turning it, it turns well, though it helps to use sharp tools if you are new to working with it.